First and foremost, I’m grateful to be alive and breathing. 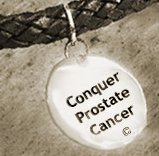 As one of the nearly 90% of almost 200,000 men a year, whose prostate cancer is diagnosed at an early stage, I got IT before it could get me. Not a day goes by when I fail to silently thank my outstanding robotic surgeon and contributing author, Dr. Robert Carey, for making this possible. I’m truly thankful for my relatively good health. I’m grateful for our readers and those of you whose shared concerns and experiences make for our common bond. I’m thankful that I can share my thoughts and views with you in an upbeat, informative way, and that some of you have expressed your thoughts here in return. I’m grateful for my innate optimism, despite occasional depression due to personal issues and this high-stress economy that has derailed all too-many folks. The capacity to see a glass filled at mid-point as half-full and not half-empty is a gift I have given myself. It’s one I try to share with others online and in person. I’m grateful for my family, starting with my wife, Yvonne, whose comments from a woman’s perspective grace my book, published only a year ago. She has been my life-long partner for over 37 years, through various ups-and-downs. We’re fortunate to have each other to jointly confront serious individual illnesses. On the other hand we’re both grateful for sharing times of joy like this Thanksgiving Day. My wife and I are both grateful that our son Dan’s in-laws are not “out-laws.” He gets along great with them and so do we. What a relief! I’m grateful for my family’s twin cats, Oreo and Taski. At age 7 in human years, they may be overweight, but they return the love we bestow on them more than they know! As an example, before I was wheeled into the operating room prior to my radical prostatectomy, I imagined stroking the soft fur while hearing the soft purr of one of these little guys. It’s as if he was right on the gurney with me. This was so soothing it helped me face surgery without fear, augmenting other types of visualization I applied. Last I’m grateful I can give back nearly as much as I receive. I’m still working on giving MORE than I get, but frankly that not happened…yet. Happy Thanksgiving…and may you too count your blessings today and every day.